This conversation on the coolest kitchen gadgets was sponsored by Gear Best. View our complete disclosure policy here. 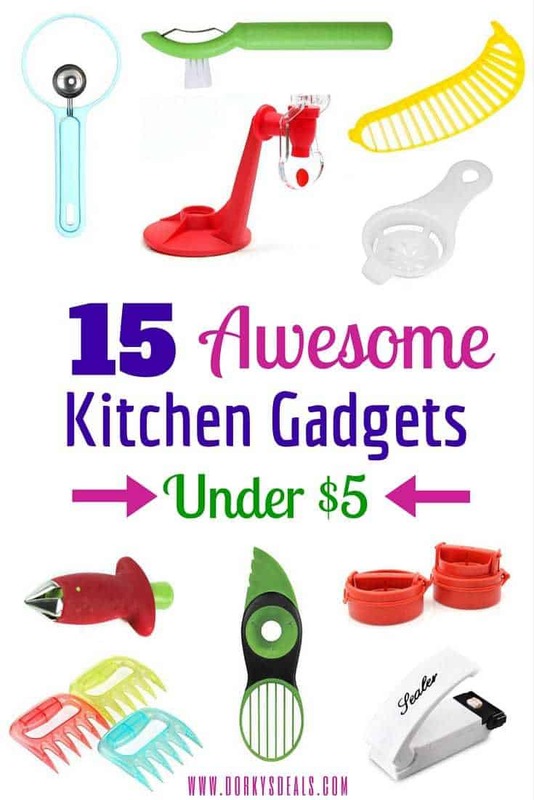 Below you will find 15 awesome kitchen gadgets each under $5. I came across all these great kitchen tools and gadgets while pursuing my new favorite retail site for affordable household and electronic items, GearBest.com. I couldn't believe the low prices of these awesome gadgets – each under $5. If you are thinking… “I bet they get you on the shipping charges,” you are wrong. All 15 kitchen gadgets listed, as well as almost all the items I came across on GearBest.com, come with free shipping. Yes, that is right – 100% free shipping. No catch! 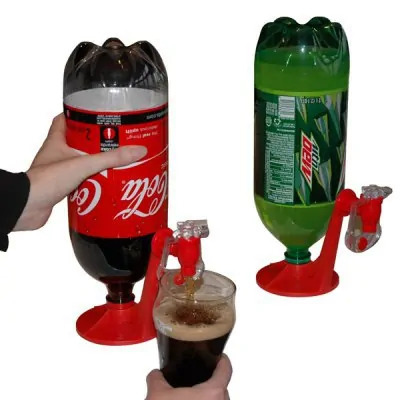 This nifty Soda Dispenser allows you to easy dispense bottled beverages like soda, seltzer, or water. Simply attached the device to the top of the bottle and turn it upside down. Then simply press your cup against the device and it pours right out. Save time by slicing a banana in seconds with this yellow Banana Slicer. The Banana Sliver is easy and fun to use. It's large size makes it big enough to cut any size banana. Now the Mini Plastic Bag Sealer is one gadget that I honestly use all the time in my own kitchen. It is so practical and easy to use to reseal any plastic bag. After allowing the device to heat up, you simply glide it along the top of the plastic bag to reseal it. With an airtight seal, your food will stay fresher for longer. 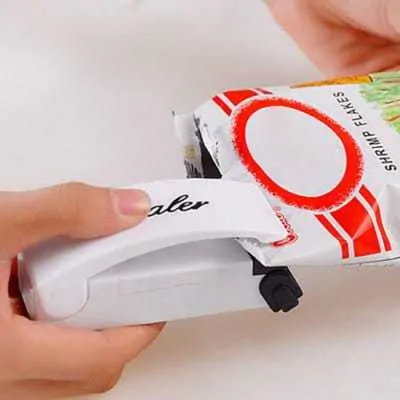 Plus, to make sure that your Mini Plastic Bag Sealer is always handy, the machine comes with a magnet on the back so you can stick it right on the side of your fridge. Whether you only need egg whites or only need egg yolks, this handy device will be useful in separating the two. 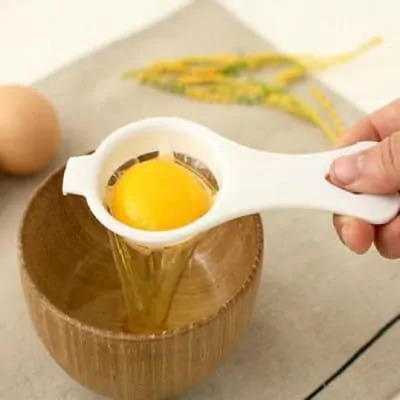 The Egg Yolk Separator makes separating the egg white from the egg yolk easy peasy. Just crack your egg, pour it into the Egg Yolk Separator , and the white will fall through while the yolk stays put. With a hole in the handle, you can hang the gadget on a hook while not in use. As a guacamole-lover, you better believe that I have a 3-in-1 Avocado Pitter in my kitchen drawer. 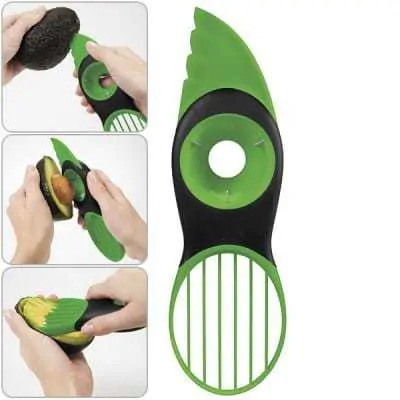 The tool has a knife to slice through the tough avocado skin, a pitter to remove the avocado's pit, and a slicer that perfectly slices your avocado. I love multi-function tools, and this 3-in-1 Avocado Pitter definitely makes the cut. Cheddar stuffed burgers anyone? 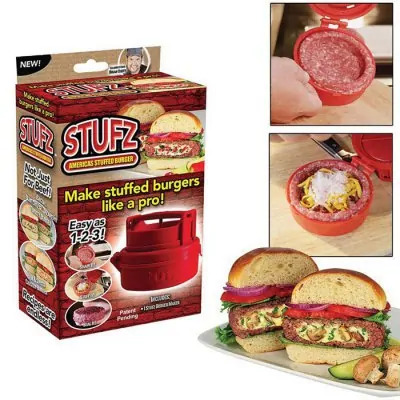 Make restaurant-quality stuffed burgers at home with a Stufz Hamburger Burger Maker. Just press your ground meat into the hamburger maker, fill with your favorite ingredients, and close the top of the device to seal your filling in the patty. Then remove the patty and cook it on the stove-top or grill. 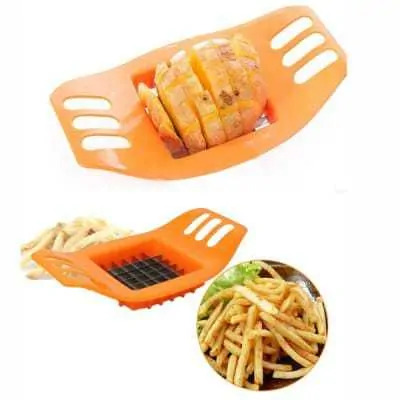 Making homemade french fries can be simple using this Potato Slicer. Just stand up your potato and center it under the slicer and push down. Bam! Just throw those sliced potatoes in the oven or fry them up on the stove. Couldn't be any easier, or any tastier. Yum! 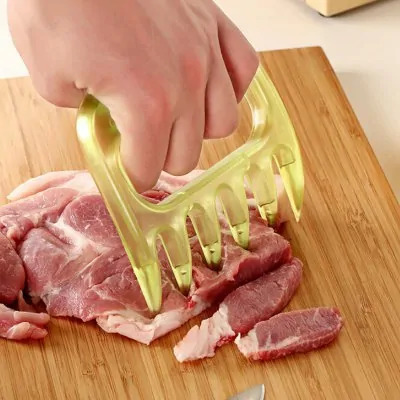 This ergonomic Meat Claw helps to hold down and stabilize a piece of meat so that slicing it is easier. It is also useful to shred meat to make pulled chicken or pulled pork. Use this 3-piece set of Dumpling Molds to make various size dumplings. Simply place the dough in the mold, fill with your favorite ingrdients, and close to seal the dumpling. Easy peasy. 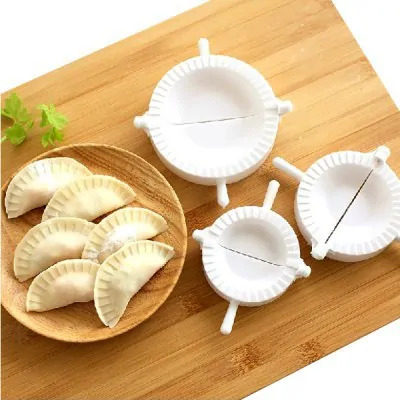 The dumpling molds are made of plastic and keep the dough from sticking to them, which makes perfect dumplings and an easy clean-up! This girl loves her noodles. But then again, who doesn't love noodles? 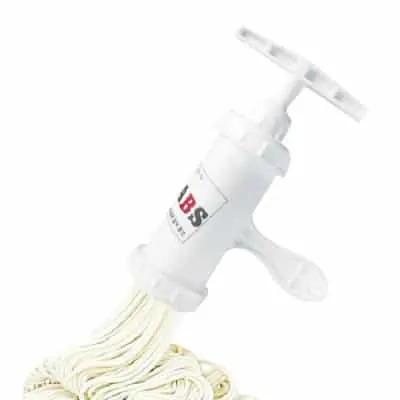 Making homemade noodles doesn't have to be hard, thanks to this nifty kitchen gadget. This handy Manual Noodle Maker comes with 4 different noodle molds, 2 flat noodle molds and 2 round noodle molds. Just place the dough in the device and push down and volia! Noodles!! 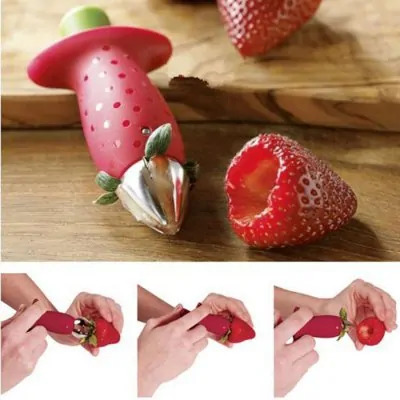 This Strawberry Seeder not only allows you to take the stem off a strawberry with the push of a button, but it is itself also designed to look like a strawberry. It is super cute, and functional too! The first step to making yummy stuffed cupcake is to “core” your cupcake. Make delicious stuffed cupcakes with ease with this Cupcake Corer. 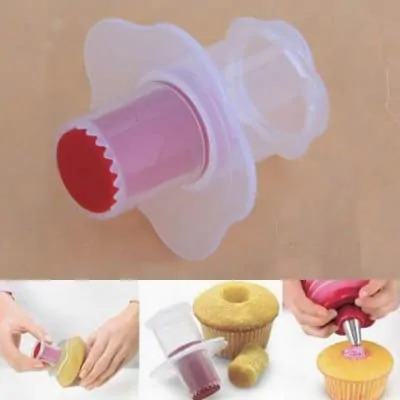 Just bake your cupcakes like you normally do, let them cool, and then use this gadget to make a hole the perfect size and shape for filling with custard, icing, ganache, caramel, or whatever your sweet-tooth desires. Slice an entire apple in one go with this awesome Apple Slicer. You simply place the slicer on top of your apple, holding the handles in both hands, and then push down. Your apple will be cored and sliced into perfectly shaped slices within seconds. Enjoy with or without peanut butter — but I suggest with. 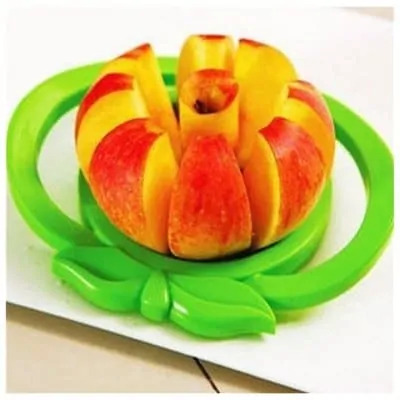 This Apple Slicer can also be used to slice other fruits as well. 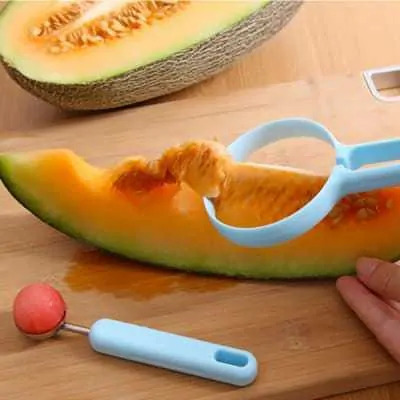 This multi-use Seed Remover / Fruit Baller is the perfect tool for seeding and balling melons for fruit salads or other fruity treats. For easy storage the baller snaps into the handle of the seeder, allowing them to stay together and take up less space. Removing corn kernels from the cob is simple with this ergonomically designed Corn Stripper With Brush. The brush can be used to scrub your corn after husking it. 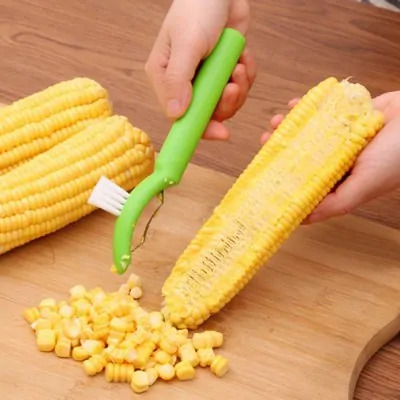 And as if you needed another use for this awesome kitchen gadget, the Corn Stripper can be used to peel other veggies such as cucumbers as well. What is your favorite kitchen gadget on the list? Do you already own any of these items? 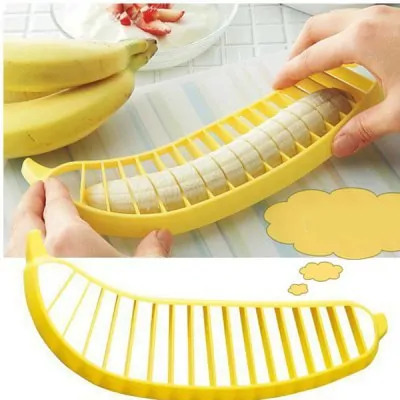 I love that Banana slicer. I want to try it myself, it looks like a fun item to use! That plastic bag sealer is a great idea.